Thai massage has a lot of background and complexity. Many will recommend going to Thailand and Chang Mai to study and I think that’s a great option for those who can afford it. As a long term 16 year practitioner massage therapist and yoga teacher I’ve my own thoughts on education and what I see in the western marketplace. If you want quick and easy I’ve got a few options. 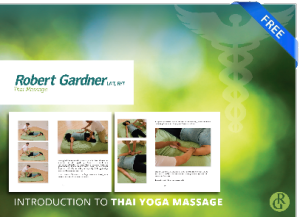 Would you like a Free Thai massage workbook? Would you like 250+ hours of video instruction you can access immediately? I pride myself on the best of simple easy instruction for western students who want to get started whether they are licensed therapists, yoga teachers or amateurs who want to help friends and family. What about a 10 day drip course on back pain? I show you a single technique each day for 10 days and walk you through a simple sequence for upper back and neck pain in addition to low back pain. First I recommend if you’re a westerner that you possibly study with a western teacher to study and learn the basics. Mat based Thai massage clothes on includes lots of use of your legs and feet and you’ll need to be able to use your body in Thailand to be able to perform sessions and add nuance that Thai teachers can give you. Second I think that western clients and therapists have different context than Thai practitioners and receivers. Thai teachers will never teach you how to sell your work and market it in a western marketplace. Most of what I’ve done as a western teacher and practitioner is help students translate the work in a different cultural context. The bodywork itself is amazing. Western students are still confused about how to learn it how to practice it and even more how to sell and package it. I’ve gone through those same issues so it’s easier for me to translate that to an American mindset. I’d like to point out that it’s also good to study with different teachers so you understand what you like and almost more importantly what you do not like. How does the teacher make you feel? How does the therapist make you feel? In the end I think those things are extremely important. My social media is extremely active and you can learn on any of my channels. Follow me wherever you are for ongoing interaction. If you need to message me you can even do so in video on instagram if you would like. Back Pain Relief Do I Need A License To Do Thai Massage?